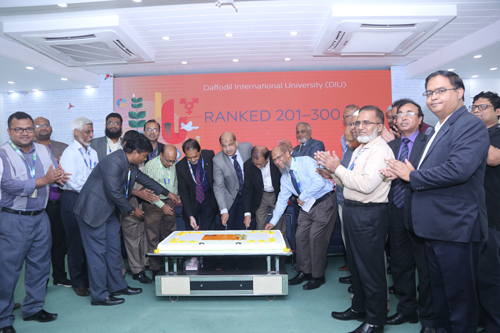 Professor Dr. Yousuf M Islam, Vice Chancellor of Daffodil International University celebrating achievement of prestigious position for the first time in Bangladesh in Times Higher Education (THE) University Impact Rankings-2019 today at 71 Milonayoyton of the university. It is worth mentioning that Times Higher Education (THE) is a world university ranking authority, widely recognized internationally and considered to be a leading provider of higher education data. THE University Impact Rankings is a pioneering initiative to recognize universities across the world for their social and economic impact, based on the United Nations’ Sustainable Development Goals (SDGs). DIU’s inclusion in these rankings is itself a great achievement and it marks DIU as a global pioneer – demonstrating its commitment not just to supporting the SDGs through its teaching, research and knowledge transfer, but also to embodying the goals in DIU’s internal practices, policies and procedures and providing verifiable evidence of its activities. To mark this great achievement Daffodil International University organized an Special Celebration of Achievement of World University Rankings today (April 04) at 71 Milonayoton of the university where Professor Dr. Yousuf M Islam, Vice Chancellor of Daffodil International University was present as the chief guest. Professor Dr. Kabirul Islam, Director ( Research) of the university presided over the program, The function was also addressed by Professor Dr. S M Mahabub Ul Haque Majumder, Pro- Vice Chancellor, Professor Dr. Engineer A K M Fazlul Hoque, Registrar of the university.